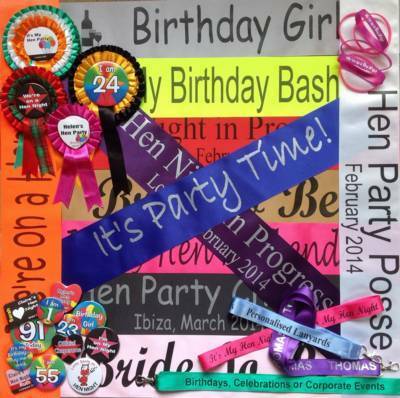 Whether you are the Bride, the Chief Bridesmaid, Maid of Honour or friend who has a Hen Night to plan, or whether you are a relative or friend trying to organise a birthday party then hopefully on the following pages you will be able to find some good hen night ideas to help you make the day a successful event that everyone will remember. We have been helping party organisers to add the finishing touches to their party celebrations since 2000. During this time we have been involved in thousands of events from destinations as far away as the West Coast of the USA and South East Australia to ones that were taking place in our own village. If you require further information on any of our products, or help with your hen night ideas, prior to placing an order then there are links below which will give you additional information. Qulaity printed 100mm wide ribbon - 1.8M in length with your message printed in your choice of colour and font, on either the front of the sash, on the back or on both the front and the back. Metallic colours are also available as an option. Choose from a selection of different lanyard styles.- ribbon lanyards and woven lanyards - with low minimum order quantities. Available as either a ribbon wristband or as the traditional silicone wristband. Your choice of colour and text. 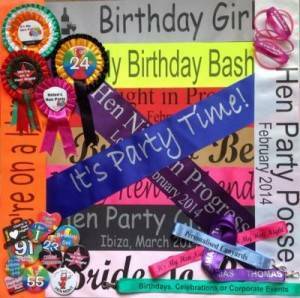 If required we also have wristbands off the shelf with a standard message of 'We're on a Hen Night'. Combining customisation, quick delivery and one stop shopping at an attractive price, our badge packs let you order badges and rosettes for your event and to add other items like lanyards, wristbands and sashes, with no increase on top of the badge pack postage costs. In addition to the personalised products we also have a selection of other party items which can be bought on line. Chess Sets::If it 's a birthday party then our hand made wooden chess sets could be the perfect gift that you are looking for. Follow the link above to learn more about these gifts.